Do your kids struggle applying their math learning to real world word problems? This resource provides you with 10 Volume Word Problems that are perfect for math notebooks or daily review. 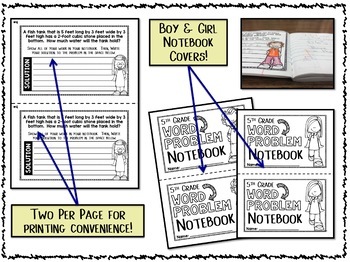 Designed for either the full sized or half sized composition books, each of these volume word problems will help you increase the rigor in your classroom by allowing you to pose a word problem problem to your students, have them show all of their mathematical thinking and calculations in their notebook, and explain their reasoning. 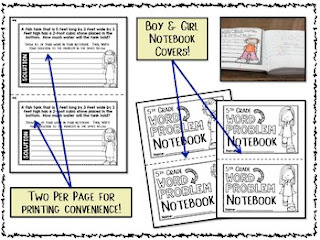 Word Problems for 5th grade math notebooks will allow your students to apply their learning to real world problems as you spiral them through the standards all year! GET ALL 200 MATH NOTEBOOK WORD PROBLEMS FOR 5TH GRADE AT A GREATER THAN 50% SAVINGS IN THE BUNDLE!! !